The new Moto Z3 Play features a slim body, a big, 6-inch screen with small bezels, and a surprisingly good camera, all of that in a phone that costs $500 and will compete directly with the popular OnePlus 6. So... are there any hidden pitfalls? And what about all those fancy Moto Mods? 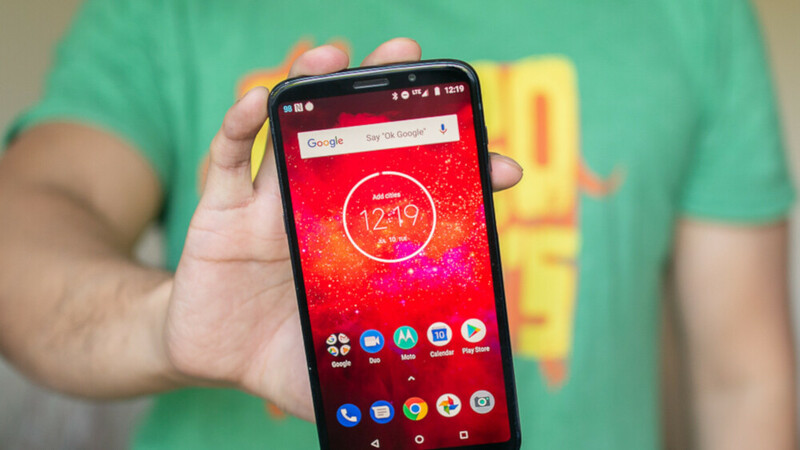 We have already reviewed the Moto Z3 Play in detail here, but if you don't quite have the time to read the full review and just want to learn the essential takeaways, then this list of our 10 most important findings about the phone should be useful. The Moto Z3 Play is one of the thinnest phones around, a design decision that has stuck with the Moto Z series and that's not just a coincidence. The thin body of the phone allows you to snap Moto Mods without adding too much bulk to the phone. If you choose to use the phone without any mods, though, you will enjoy a very slim device and one with a sturdy metal frame and a beautiful glass back. One thing you should know about the Z3 Play is that it does not have a 3.5mm headphone jack, so you would need to use an adapter, USB-C earphones or a dongle. Thankfully, you do get an adapter in the box, so you don't need to buy one separately. Just be careful not to lose it somewhere. The most peculiar design decision in the Moto Z3 Play has got to be the fingerprint scanner, and more precisely, its position on the side of the phone. It's located on the right side, within easy reach, while the power key is on the left side, and way harder to reach. This is a strange setup that does not make much sense. We also found that the fingerprint reader is accurate and unlocks the phone quickly, but... it happens to be in a place where your thumb naturally stays when you hold the phone, and you can touch that fingerprint scanner accidentally (at least, that's what happened to us). You feel a short vibration when you accidentally press it and our phone was buzzing often in our pockets. The Z3 Play comes with a 6-inch "Max Vision" Super AMOLED screen with small bezels, but it's not quite a bezel-less phone as you still have a noticeable top and bottom bezels. The screen, however, looks good: it features lush, saturated colors and it gets very bright, so it's easy to see it outdoors. The color temperature is close to the target 6500K, which means that you get accurate colors that do not appear bluish as on some other phones. The resolution is 1080 x 2160 pixels, not quite Quad HD, but still sharp enough for most people, so we have no complaints here. The Z3 Play runs on Android 8.1 Oreo with a very light Moto skin on top that basically adds a few gestures like the chop-chop shortcut for the torch light and the twist action to quick-start the camera. The biggest innovation in the interface, however, is a the new gesture-based navigation. You get the "One Button Nav" as an option to on-screen buttons: a big, spacebar-like button appears on the bottom of the phone and you swipe it up and down and to the side. The problem with that button is that it's not as easy to hit it as it is to get gestures without a button right, so this navigation method seems a bit fiddly, but we do like having the option. The Moto Z3 Play is a mid-range phone and one place where this makes a difference is under the hood: the Snapdragon 636 chip on board is nowhere nearly as fast as the flagship-grade Snapdragon 845 system-on-a-chip. Don't get us wrong: you don't notice this much in the daily grind, scrolling on the web, taking a picture, or making a call, but when you push to phone to its limits with things like gaming, you notice that it is not running as smoothly as a flagship phone and drops frames often. Bottomline: not the best phone for gamers. While we were blown away with image quality on that other $500 phone (yep, we mean the OnePlus 6), the Moto Z3 Play also impresses during the day (but maybe not so much at night). Images during the day turn out good, with a decent dynamic range and pleasing colors, so we liked the results, but as soon as the sun was about to set and it got darker, photo quality dropped significantly and the phone had a really tough time capturing a sharp photo. The Z3 Play features dual rear cameras with a main 12-megapixel shooter and a secondary, 5-megapixel camera used for depth information to blur the background in an image and make your subject pop. This portrait mode had trouble separating a face from its background and you can notice the artifacts right on the edge between the person and the background. Overall, we have definitely seen better implementations of portrait mode than this one. Finally, you also get a new Cinemagraph shooting mode that results in an animated GIF where only a part of the image is moving and everything else is static. This interesting effect is fun and creative folks will appreciate having it, but don't expect much in terms of technical image quality here. While the Moto Z3 Play does support 4K video recordings, we can't recommend it to vloggers and those who care about video quality. If you opt to shoot in 4K, you get no video stabilization, which results in shaky footage that will make your head spin. You could remedy this if you buy a smartphone gimbal, but that's one more purchase to make and one more hassle. What we loved about the Z3 Play is that it comes with a free battery Moto Mod in the box. Moto claims that with this Мod, you get a 40-hour battery life, nearly two full days, and we do agree. If you don't stress it too much, it could be possible to go even three days off the charger. And the phone itself also support quick charging, so a 30-minute top-up gives you an additional 12 hours of battery life. On its own, without the battery attachment, the phone relies on a built-in 3,000mAh battery that scored slightly above average in our battery test, but you would need that battery Mod to get the impressive 2-day+ battery life. Keep in mind that despite its glass back, the Z3 Play does not support wireless charging and you would need a separate mod for just that. What about the other mods? Well, some of them are truly awesome: you can get a JBL mod that turns your phone into a small yet powerful wireless speaker, you can get a pico projector or a few other cool things. Moto Mods: you get a free battery Mod in the box! While you can get something like the excellent JBL SoundBoost 2 Moto Mod for just around $60 and have some truly outstanding audio quality on your phone, the built-in speaker on the Moto Z3 Play does not impress us much. It's a bit too weak and lacking in clarity. One more reason to get that SoundBoost Mod, right? Summing it all up, the $500 price of the Moto Z3 Play might be a bit too much to ask. We were underwhelmed by the low-light photo quality and lack of 4K video stabilization, the slow performance for gaming due to the weaker Snapdragon 636 chip. If you care about those things, devices like the OnePlus 6 might be a better fit for you. But if you want the absolute best battery life on a phone around, as well as the versatility of Moto Mods, the Z3 Play is a phone that really has no rivals, so go ahead, you probably won't regret it. So many reviews out there but Lenovo have not even started selling it (at least in Asia). I've been waiting for this as it is arguably the best looking Moto Z smartphone with its perfect bezel-less display. Just wait till Z3 Force comes out. The Play will look like a toy.